Full Description: One of a group of publicity cards, adverts and postcards of “George Young, Blind Musician”. 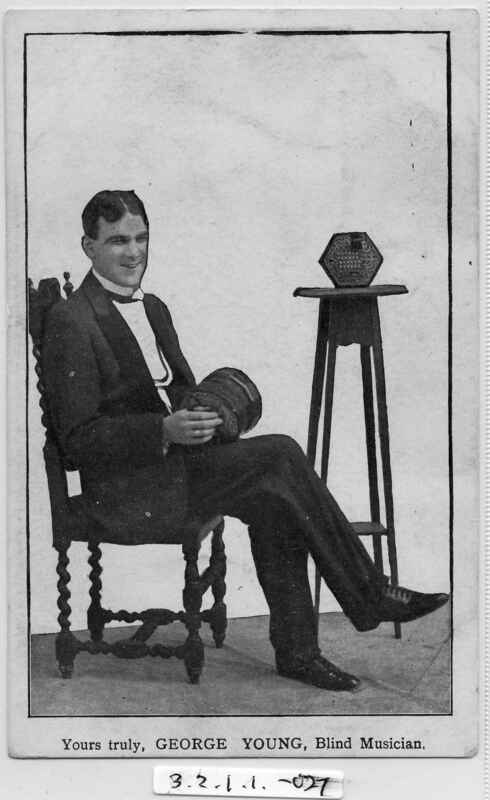 In most, he is seated on a turned-wood chair holding a Lachenal Edeophone metal-ended English concertina, with a 48-key metal-ended English concertina on a nearby pot-stand. Most are signed in the print with a message from Mr Young, and most are simple advert cards, NOT postally divided to the rear. This one has the message “Yours Truly, George Young, Blind Musician”. See also Items 3.2.1.1-008 , -009 , and 010.